On this page, you'll find a birding checklist, information about our grant program and some helpful links. Mission: The Stockbridge Audubon Society is a non-profit organization that promotes the awareness, understanding, enjoyment and stewardship of the environment and natural resources of Northeastern Indiana. Birds were our beginnings, and we remain dedicated to birding as the basis for our mission to conserve and restore our natural ecosystems, focusing on birds and other wildlife for the benefit of humanity and the earth's biological diversity. In 2015 Stockbridge Audubon Society is initiating a mini-grant program (with a maximum of $250 per grant). These grants are intended to fund projects that promote our mission as stated above. They may be given to individuals or to groups. For example, projects could be educational (so as to disseminate knowledge about birds and the habitat that sustains their survival), they could be aimed at furthering the preservation and stewardship of the natural resources of Northeast Indiana, or they could involve research directed toward furthering our understanding of bird behavior. Conference or workshop attendance may also be supported. Those receiving a grant will be expected to write a report to the Stockbridge Board explaining how the funds assisted in achieving the goals of the project. In addition, the recipient should be available to disseminate information about the project through a presentation at a public event or through a written article. StockbridgeAudubonofIndiana@gmail.com and received no later than April 1. The Stockbridge Audubon Society Board will evaluate the applications. Recipients will be notified no later than May 31. Description of the event or workshop to be attended. 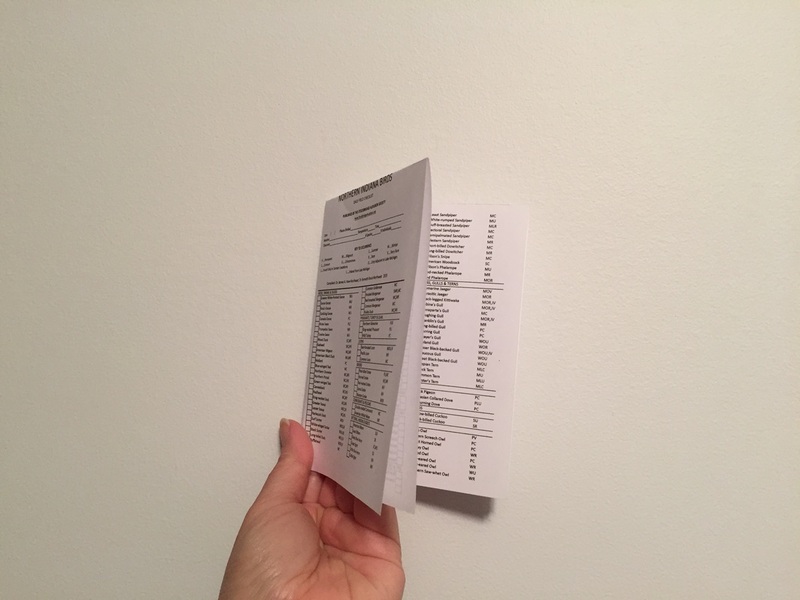 Click the link below for a printable bird list, fold in half, then fold again as shown above.